While we're on the topic of money: Canada's banks (see last post) are of course not the only ones interested in my financial situation. The governments like to take a rather close look, as well. 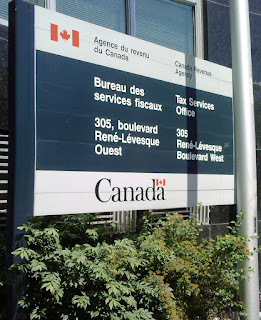 And the plural was not a typo: As a resident of la belle province, I have to deal not just with the federal agency, Canada Revenue, but also with its provincial counterpart, Revenu Québec. In other provinces, a citizen is prompted to fill in one tax declaration, based on which the federal authorities then collect both what's theirs and what the provinces tax, and remit the latter to the provinces. Interestingly, in Switzerland it's the opposite way around, with the cantons (= provinces) collecting taxes, and passing a share on to the federal government. Top-down or bottom-up, it's one single process. But not here, where the mutual distrust between Québec and Ottawa is such that neither wants to rely on the other to do a proper job. (Admittedly, the federal government's track record on honesty isn't exactly unblemished...) In consequence, citizens are required to file their tax returns twice, once for the Maple Leaf and once for the Fleur de Lys. "Well, if they can't get their act together, why bother?" my Swiss friends may ask. That was my first thought as well. Until I made a rather surprising discovery on my first Canadian paycheck. Unlike in throughly bottom-up Switzerland, Canada (along with most other states, or so I gather) in fact asks employers to withhold the estimated tax burden directly at the source, i.e. before that sum ever reaches an employee. To be on the safe side, they withhold rather too much. And burghers, if so inclined, can then jump through the hoops of filing two tax declarations, appying all the tax breaks they can think of, in the hope of getting some of that money back. Talk about smart incentives! I have to concede that after an initial phase of outrage ("Where is the rest of my money?? "), I came to like this system. It takes away the uncertainty that plagues taxpayers in the Swiss system, wondering how much money they have to put aside in order to pay that massive tax bill when it finally comes at the end of the year. Instead of that, Canadians usually know that whatever ends up in their accounts is theirs, and that they may get some additional cash back from the government if things go well. And so it was with distinct enthusiasm that I fought my way through my first two tax declarations a while ago - without kids, property or student loans, the complexity was manageable. And sure enough, only three weeks after my submission, Canada Revenue deposited the expected tax return in my account. But what about the money Revenu Québec owes me? Another six weeks have passed and I've heard nothing, until I ran out of patience the other day and called their automated status hotline. After punching in my details, a cheery but automated voice confirmed: "Nous avons reçu votre demande. Mais nous ne l'avons pas encore traitée. Merci." Yes, they sit on my money. No need to rush. Smart incentives, indeed!